Blindly differentiate between sales and customer support and you’re making a huge mistake. Nowadays, the two are intrinsically interlinked. In fact, at OnePageCRM we don’t have a dedicated sales team, rather our Customer Success team encompasses both support services and sales. With support teams now also responsible for elements like customer success and concierge-style onboarding, they have a lot of information that they can share with sales teams. Support staff can foresee likely objections and in many cases, they can head off problems before they arise. What’s more, when sales have direct feedback from support, they can better predict common objections and hesitations that support hears from customers. A sales team that is numb to feedback won’t be as persuasive as the one who understands customer opinions, excitement, and complaints from the front line. 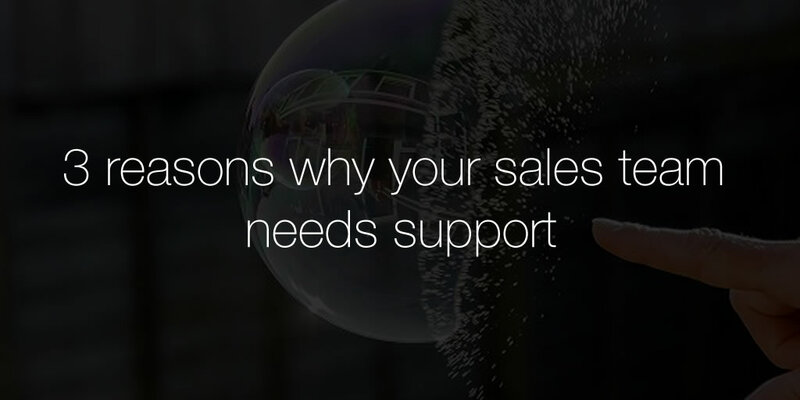 Open lines of communication between sales & support staff is critical to sales success. Have your support team store a note in the CRM with relevant information from all interactions with a contact. 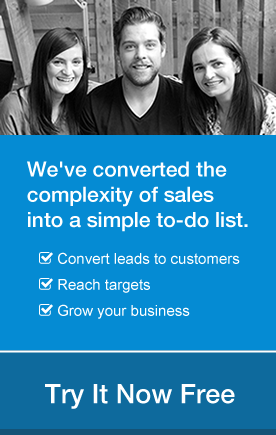 That way, when it’s time for sales to get in touch, they never enter a conversation blind. Rather hyper-informed with information relating to the contact’s role, industry type & background. 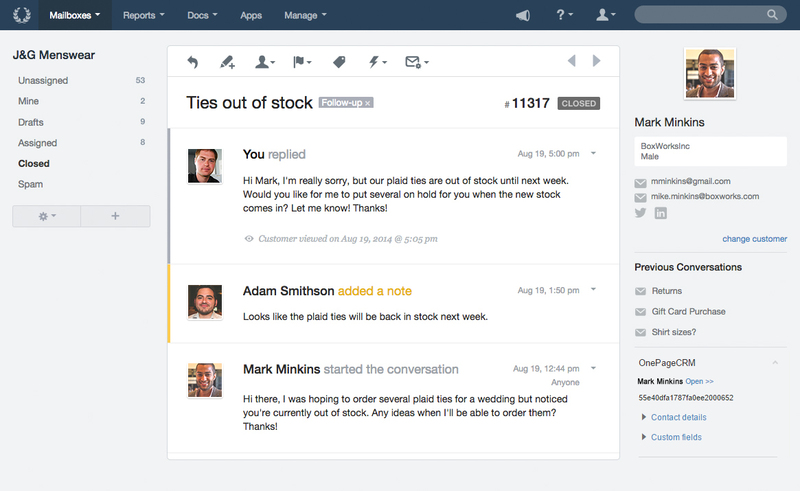 A simple idea our friends at HelpScout shared with us is the “Support Bulletin Board”. Once their support staff have gone through feedback and organized common customer questions, they post an update to the “Support Bulletin Board”. This knowledge base outlines a variety of sections of customer feedback, all useful to sales teams. Customer love: What are customers really loving about the product? What are they saying about why they “switched” from a competitor? What was the catalyst for them doing so? You’ll be surprised how many customers share this with support when they create their first ticket. 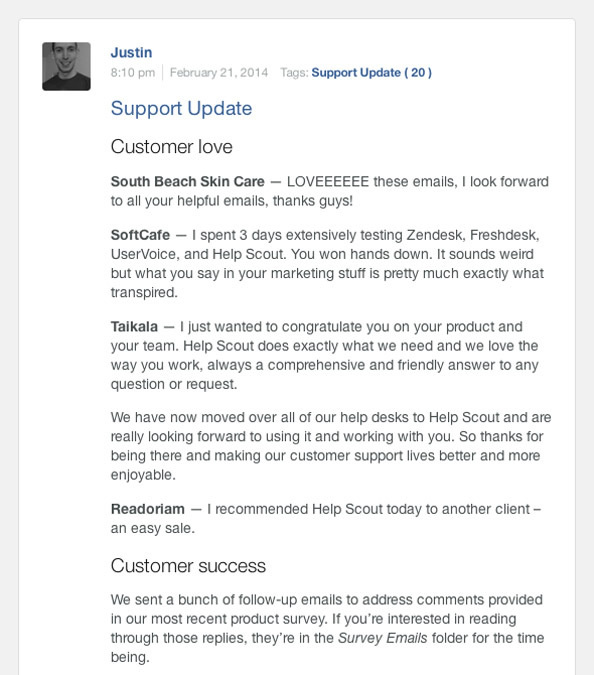 Customer success: How did onboarding of new customers go? This reveals a lot of potential problems customers may have with the product. Where were they struggling? Knowing this is a constant reminder for how “newbies” look at your product. What’s new? Were there any new articles added to the knowledge base? Why were they added? What problems did they help customers solve? If a repeat issue is tackled, this adds another argument to the salesman’s toolbelt. Another way that looping in support is important is that the support team of today can act as “qualifiers” to your sales teams “closers.” Support is often where some companies make first contact: “Hey, we had some additional questions about your product…” The first touch of support here can lead the way to a salesman if the customer needs a little more persuasive effort to see what sort of value the product really brings them. This doesn’t happen if sales and support live on separate islands, communicating through a string and a pair of cups. Integrating OnePageCRM and HelpScout you’ll always have the latest communication with customers and leads at your fingertips. 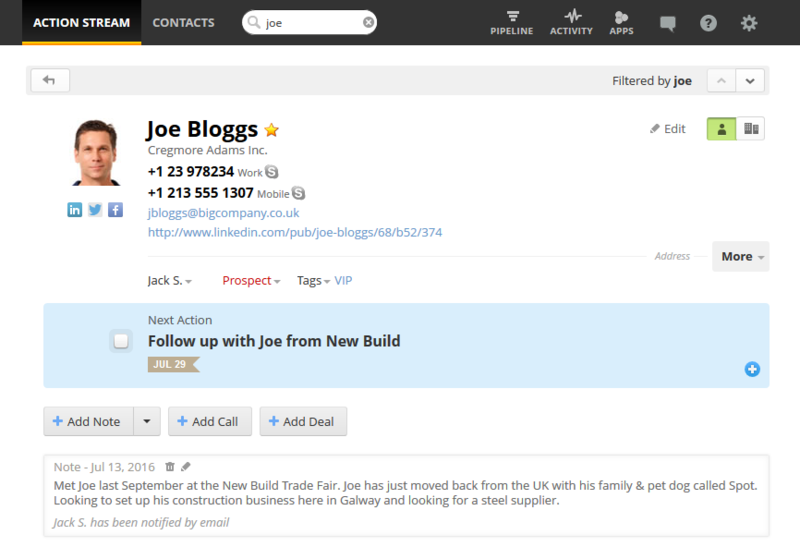 You can see a contact’s essential information in the customer sidebar – including their Next Action, deals, status, tags, etc. You can also add a contact to OnePageCRM in just one click.